When I attend a magic convention, I enjoy the dealer's show very much. It sends me hurrying to the dealer room to see up-close what I just witnessed. After all, maybe it's something I should add to my show? I also enjoy all that magic did for me as a child and the contribution it has made to my life as an adult. Magic put me in front of people, increased my confidence, built creativity, encouraged my ability to read and comprehend oftentimes cryptic directions, expanded my memory and many more skills that I still leverage in my career today. So ... I began to design a show that I would perform for family audiences and then sell everyone of the tricks in the back of the room. A catalog would be available not only detailing the magic for sale but also the age-appropriateness of each trick and what developmental quality in the child that magic trick would help develop. The tricks that I chose had to be easy to self-­manufacture for under one dollar (to give me more than reasonable profit margin), demonstrate well from the stage or close-up, and be at the skill level of an elementary age child to make him or her feel successful. 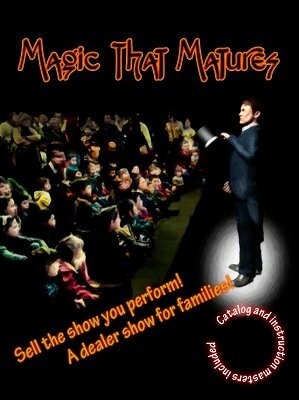 The stage show I use to demonstrate some of the magic that will be for sale following the show. Once you manufacture the tricks you're ready to go with a unique show others in your area aren't doing! 1st edition 2012, 88 pages.